Marzia and I were very much looking forward to checking out Charlie Bird after hearing so much about the opening over the last few months. We weren’t disappointed. Our dinner was absolutely fabulous. Charlie Bird is the brainchild of Chef Ryan Hardy and restaurateur Robert Bohr. Hardy is best known for the time he spent at the Little Nell in Aspen, while Bohr developed one of New York’s most ambitious wine programs at Cru during the pre-financial crisis heyday. At Charlie Bird, Hardy and Bohr have teamed up to offer a thoughtful menu paired with a brilliant wine list in an edgy, hip space that is pure Soho. A decidedly urban soundtrack adds to the energy of the rooms. Hardy’s cuisine borrows two key components from the Italian kitchen; an intense focus on ingredients over technique, and a simplicity that is much harder to achieve than it might seem. This is hearty, soulful food you can eat every day, rather than only on special occasions. If you notice the Zalto glasses set on the tables, you’re a wine geek. You are also in the right place, because the wine list at Charlie Bird is well worth checking out on its own. A number of hard to find, impeccably chosen bottles are offered on a fold out menu that lists both food and wine. The emphasis is on Italy and France, specifically Piedmont and Tuscany, plus Burgundy and the Rhône. How about the 1978 Oddero Barolo? Or maybe the Produttori del Barbaresco’s 1982 Barbaresco Riserva Asili? Roumier’s 2008 Corton-Charlemagne is not exactly the kind of wine that pops up on restaurant wine lists every day. Borgo del Tiglio, Bartolo Mascarello, Cerbaiona, Fourrier, Roulot, Lafon, Allemand and Jamet are some of the other featured producers. If money is no object, ask to see the reserve list and be prepared to drool. This is Cru in jeans and a t-shirt, as opposed to the more formal, buttoned-up feel that defined the wine experience in that space. One of the best features of the wine program is that all bottles are available as half-bottles. In other words, Charlie Bird will open any wine on the list, pour guests half a bottle and charge accordingly, which gives diners a great opportunity to taste one or more wines without committing to the entire bottle(s). Sommelier Grant Reynolds, just in his mid-twenties, possesses a remarkable command of wine influenced by the year he spent living in northern Piedmont, and an easygoing personality to match. 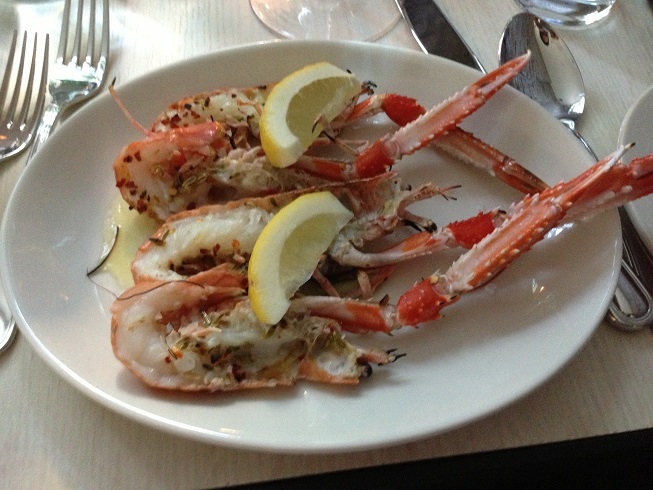 We started with the grilled langoustines, which were sweet, packed with flavor and perfectly cooked. The chiles weren’t at all necessary, as the langoustines were absolutely delicious on their own. 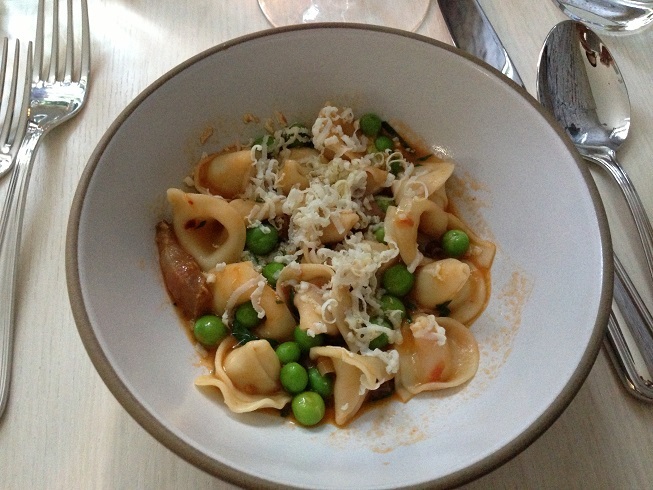 Hardy’s cappellacci with ramps, peas and guanciale guanciale (pig cheeks) was terrific. We could have easily devoured a second portion. The combination of bright spring flavors with the richness of the and perfectly cooked pasta worked beautifully. 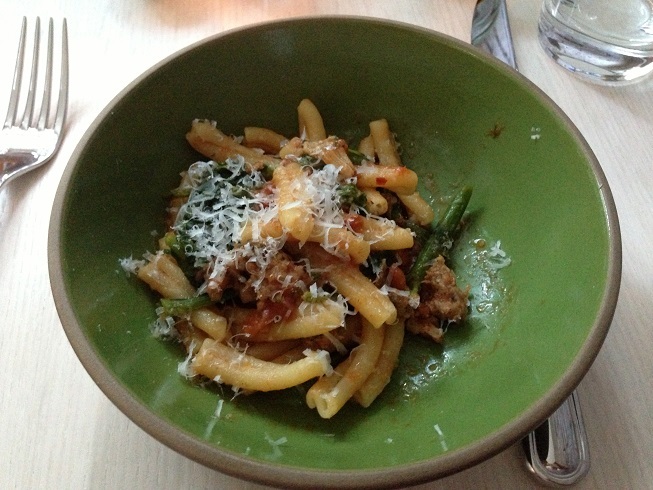 Another rich, deeply flavorful pasta, the casarecci with sweet pork sausage, broccoli rabe and Calabrian chiles was totally satisfying. I was less thrilled with the romanesco, as the intense heat was overpowering. Our two main courses were delicious. 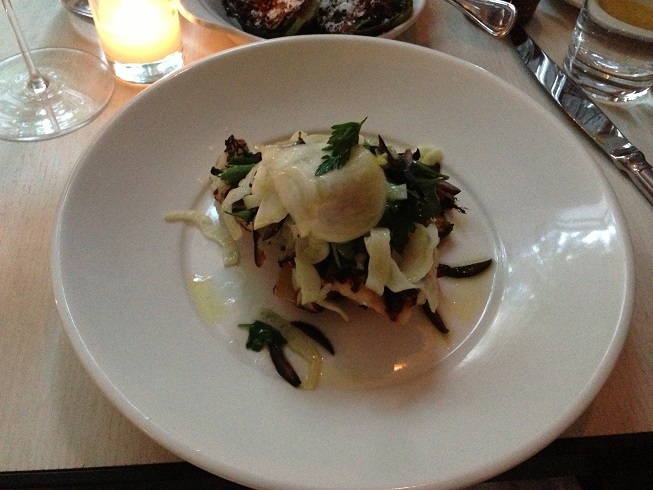 The grilled black bass with olives, fennel and Olio Santo jumped off the plate with bright flavors. Fennel shavings added texture and aromatic complexity to a refined dish that would have been a knock out, even in a far more elegant setting. Hardy’s suckling piglet with morels, peas and pepper mustard was pure comfort food in its hearty, rustic flavors. It, too, was superb. I am not a huge dessert fan, but the pistachio lemon cake was outrageously delicious. I have to admit, there were a number of wines on the list that were tempting. 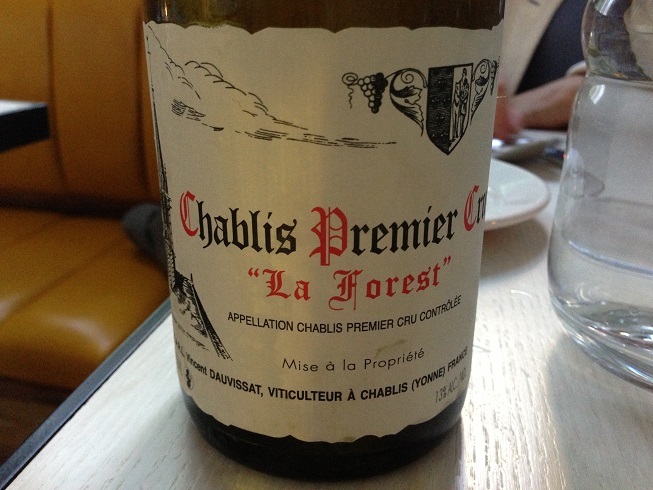 Vincent Dauvissat’s 2010 Chablis La Forest, which we ordered by the half-bottle, was superb. Just as fabulous as I remembered it, the 2010 captured the essence of the vintage in its combination of intense fruit and equally vibrant acidity. With time in the glass the 2010 seemed to become more mineral, tense and focused. What a beautiful wine. 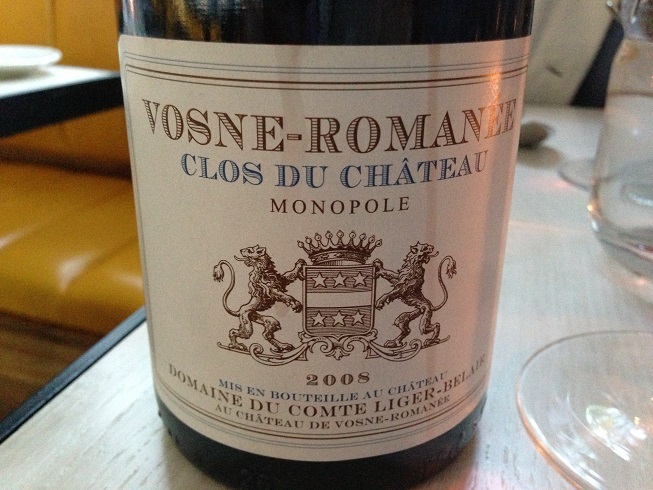 The 2008 Liger-Belair Vosne-Romanée Clos du Château was in fine form. Intensely perfumed and aromatic, the mid-weight, gracious Clos du Château was a perfect Burgundy to enjoy on a warm summer evening. Charlie Bird still needs to work out some kinks in service and timing that are normal for any new restaurant, but Hardy, Bohr and their team are off to a great start. Even though Charlie Bird has only been open for about two weeks, it is already one of the most exciting additions to the New York City restaurant scene. I would go back in a heartbeat.